Anything Larus: Kumlien's or Iceland? The subspecies of Iceland Gull (L.g. glaucoides) that regularly occurs in North America is Kumlien's Gull (L.g. kumlieni). 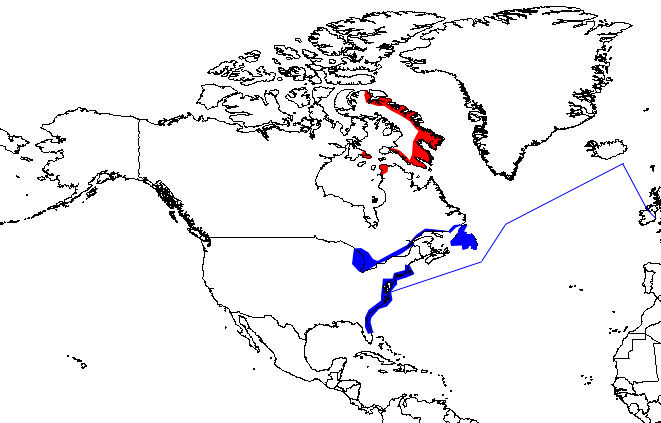 All sightings of Iceland Gull in North America should first default to Kumlien's based on range. North American sightings of the nominate race glaucoides are an exception to the rule. It is thought that the nominate race is observed yearly in eastern Newfoundland, with a ratio of perhaps 1:1000 glaucoides to kumlieni in St. John's (per comm. Dave Brown). There are multiple records of adult glaucoides from New England but it is difficult to verify the validity of these records since they lack detailed assessments of upperpart coloration. My discussion here is with respect to adults only as subadults have proven to be much more difficult to identify to subspecies and some known age birds have been known to "swap" identities with maturity (Charles). The question we need to ask in the United States is not whether glaucoides can stray into the lower 48 states, but rather, can it be distinguished from the regularly occuring Kumlien's? Most adults are easily distinguished since the majority of Kumlien's show some darker gray tones to the outer webs of the outer primaries. The confusion arises in what Steve Howell has called "stage zero" Kumlien's Iceland Gulls. These are adult individuals with pure white wingtips that mimic the appearance of nominate glaucoides. The distinguishing features of glaucoides include a paler-mantle (Glaucous Gull coloration) and a pale lemon-yellow iris in all adult stages. It should be noted that mantle shade is difficult to ascertain without side-by-side comparisons of benchmark species; this is another reason why North American observers must be cautious when considering the nominate race. Other supporting features on glaucoides include a rounder and more gentle look to the head with a bill that is typically smaller than Kumlien's - but there are varying degrees of overlap. Here is an adult Kumlien's Gull (front) shown with an adult American Herring Gull. Could you think of at least 2 reasons why this isn't a nominate glaucoides? The first thing to notice is that this individual has a dark iris and the mantle appears to be very close to the shade of the Herring Gull's upperparts. Also, the outermost primary shows a thin frosty-gray subterminal mark. Howell would classify this wingtip pattern as "stage one" and it's helpful in ruling out any suspicions of a nominate Iceland Gull. Another thing that I notice in this photo is a sloping forehead which is not often found in glaucoides. In my opinion, Iceland Gull (L.g. glaucoides) is one of the most beautiful gulls of the Holarctic. Any report of this race in North America should be scrutinized with care; sightings should be well documented with photographs, preferably next to other species that can be used for comparison. Charles, D. 'Identification challenges presented by 2nd winter Kumlien's Gull'. IRBC Gallery Notes. Dunn, J. & Howell, S.N.G. 2007. Gulls of the Americas: 462-470. Olsen, K.M. & Larsson, H. 2004. Gulls of North America, Europe, and Asia (reprint).